In modern-day Pakistan is a site that was once home to as many as 30,000 people of the Indus Valley civilization. We know it as Mohenjo-Daro. In English, the name means "Mound of the Dead." The ruins of Mohenjo-Daro are a window into the mysterious civilization of the Indus Valley people. We know they were advanced. They had running water, a below ground sewer system, and possibly a forerunner to the modern bank. We will see (or read) just how much the people of Mohenjo-Daro lived like us as we discuss the ruins of their city. The people of Mohenjo-Daro apparently practiced ritual bathing. Evidence of this is one of the more iconic images of Mohenjo-Daro, the Great Bath. The Great Bath is a pool built of mud bricks and is 39 feet long, 23 feet wide, and around 8 feet deep. It was sealed with a sort of tar and had a drain that allowed the bath to be drained and cleaned as necessary. While we have no written proof that the Indus People practiced bathing rituals, it is not unreasonable to speculate about it based on the prominence of the Great Bath in Mohenjo-Daro. Artifacts such as bathing stones (used to scrub with) and cups (possibly used to hold ritual oils or drinks) were found near the ruins of the Great Bath. Incidentally, ritual bathing is a big part of Hinduism, the most practiced religion of modern India. Perhaps the ritual bathing of the Indus People was kept as part of the Hindu tradition. A granary is a structure for the storage and preservation of grain, and the people of Mohenjo-Daro had a big one. The people of Mohenjo-Daro may have used their granary as a community bank for their harvested grains, much as we use banks today. 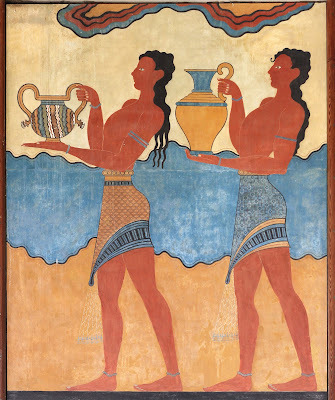 Houses in Mohenjo-Daro were similar in some ways to those of Mesopotamia and ancient Egypt. They often had two stories, a cistern or well to hold water, and clay pipes to deliver water to different rooms in the house. A central patio or open-air courtyard provided a method of ventilation for the structure. 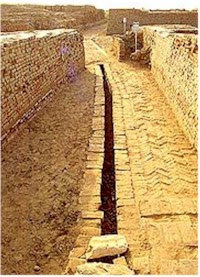 Sewage from the houses of Mohenjo-Daro flowed into a sewer line that followed down the street grid. The houses of Mohenjo-Daro were built on a street grid somewhat like neighborhoods in modern cities. Many of the streets were covered with mud brick and were wide enough for an ox-cart to drive down the middle. It is possible that the people of Mohenjo-Daro had shops on the lower levels of their houses, or they may have set up shop in front of their homes each day. 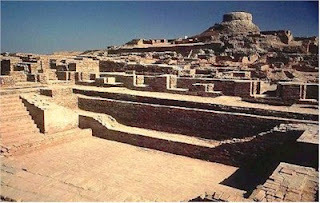 The houses and other buildings of Mohenjo-Daro used both mud and fired bricks. Mud bricks, like adobe, were made by mixing mud and straw. The brick maker then left the bricks in the sun to dry. Mud brick buildings could then be covered with another layer of mud, like stucco. These buildings were sturdy and insulated from hot and cold. Fired bricks were made by forming clay into a brick shape and then baking or firing them in a special oven called a kiln. Structures made of fired bricks were very strong, and they resisted water from flood or rain better than mud bricks. If this page was helpful to you, please consider sharing the link with someone else who might find it helpful as well. Also, I'd love to hear your questions and comments below. Long story short - Mohenjo-daro is not the ancient name. We don't know what the people who lived in the ancient city called it. The "mound" refers to the mound of earth (tell is another word for these mounds) that covered the city after being abandoned for thousands of years. At least one other Indus Valley site has mound (daro) in the name too, Chanhu-daro. It's southeast of Mohenjo-daro. "The dead" refers to the fact that those who built the city were dead long ago, a lost civilization. I can imagine the local people calling the mysterious mound the "mound of the dead" and the archaeologists who excavated and wrote about it just kept the name. It's a much more exciting name than Indus Site #23 or the like. Interestingly there were not many human remains found at Mohenjo-daro. A few, but not the numbers you might expect in a city that was home to 30,000 or so.